Aren’t these British Garden Bird stamps beautiful? We’re delighted to be able to offer this RSPB licenced garden bird stamp set as an exclusive gift available with Simply Cards & Papercraft 187. We couldn’t wait to stamp and colour with them and we thought we’d share some colouring tips in a video tutorial for you. Watch the full video at the end of this post where Janette Lane shares her tips for colouring with alcohol markers. Find out more about issue 187 of Simply Cards & Papercraft which will be available to buy in shops on 24th January! Now the great thing about stamps is that you can stamp them with just black ink and leave them as is, or you can colour them with alcohol markers, watercolours, and even coloured pencils! So many options, right? Today we’re sharing a few helpful alcohol marker colouring tips. Colouring with alcohol markers can be intimidating, but we hope this video tutorial and tips encourage you to try alcohol markers and also gain confidence. Ultimately our biggest tip is to practice, practice, practice! Lets move onto the colouring tips! Make sure your work surface is protected with a craft mat. Alcohol marker ink tends to bleed through paper even if it’s really good quality. So protect your work surface first! 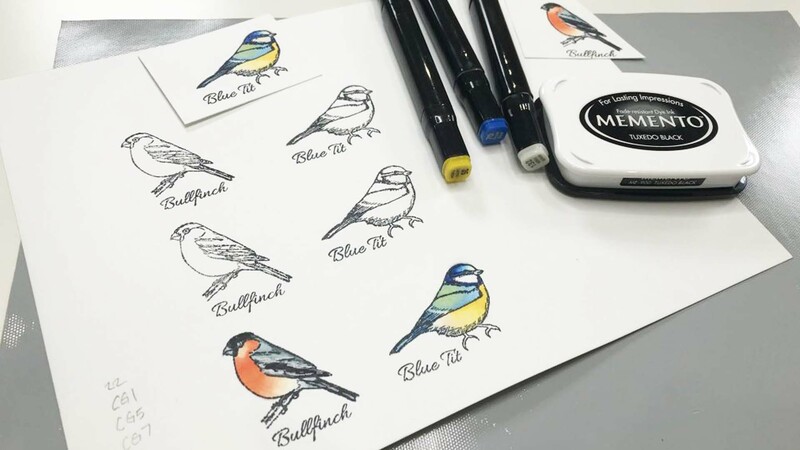 You’ll need an ink that doesn’t react to your alcohol markers.You can use Memento ink which is a dye-based ink or Nuvo Hybrid inks(also work with watercolours) are great too! Use circular strokes or flicks! It’s completely up to you. Use whatever pen stroke feels natural. Don’t worry about light source! Clare Rowlands of Daisy Mae, expert colourist, says not to worry too much about light source. As long as you have a combination of lights and darks in your colouring, you’re fine. Check your number on your markers to make sure you’re picking up the right colour. There’s nothing worse than grabbing the wrong shade and messing up your image. Fix mistakes with colourless blender! If you colour outside the lines or use the wrong colour (see previous), then absorb that colour with your colourless blender. Ink tends to spread so allow layers to dry between applications, you don’t want the colours to spread outside your stamp lines. Make a colouring cheat sheet and store it with your stamps for reference. Let say you’ve perfect your Bullfinch for a card. It’s perfectly coloured and you’re so proud of it. But when it comes time to replicate the project a few months later, will you remember what exact shade of blue you used? We know we wont! So it’s helpful to write down what colours you used for next time. Use white gel pen for highlights or details once you’re done colouring. And as with anything else, practice, practice, practice!